"The Peace and Prosperity of the Region"
On the Canberra Day holiday each year a new group of ACT Government archives become available for public access. This year, records from across the whole of the ACT Government from 1993 are open to the public. Instead of our usual Find of the Month, we've decided to celebrate by highlighting Canberra's Sister City relationships in our Find of the Year! 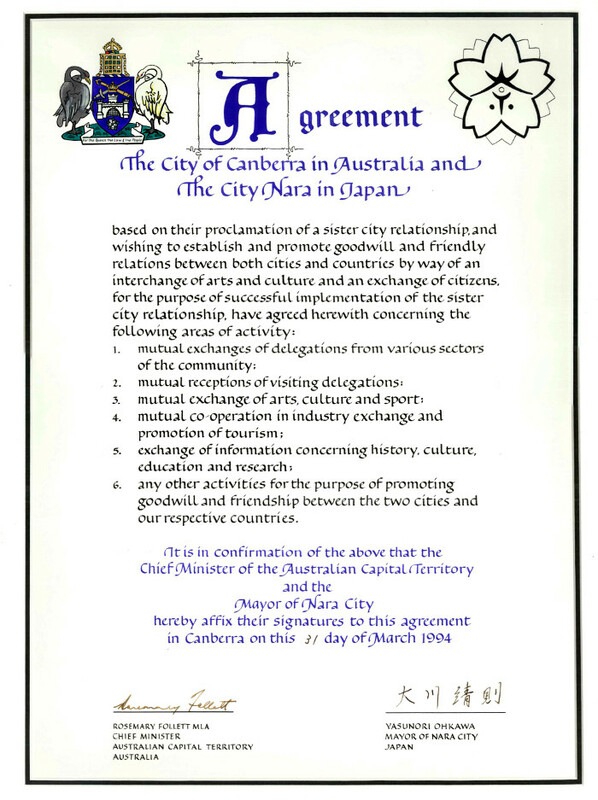 In October 1993 Canberra and the City of Nara in Japan formalised their sister city affiliation. Newly released files cover a business delegation to Japan headed by Chief Minister Rosemary Follett to "highlight the tourism, advanced technology and education industries in Canberra." The visit was the first overseas delegation to be led by an ACT chief minister since self-government. Chief Minister's Media Statement 20/09/1993 - Japan Business Delegation Announced. A PDF version can be downloaded here (PDF 324Kb). It was during this visit that an official proclamation for sister city relations with Nara was signed, on the 31st of October. The files of the visit include media statements, speech transcripts and press clipping related to this visit as well as a comprehensive mission report. 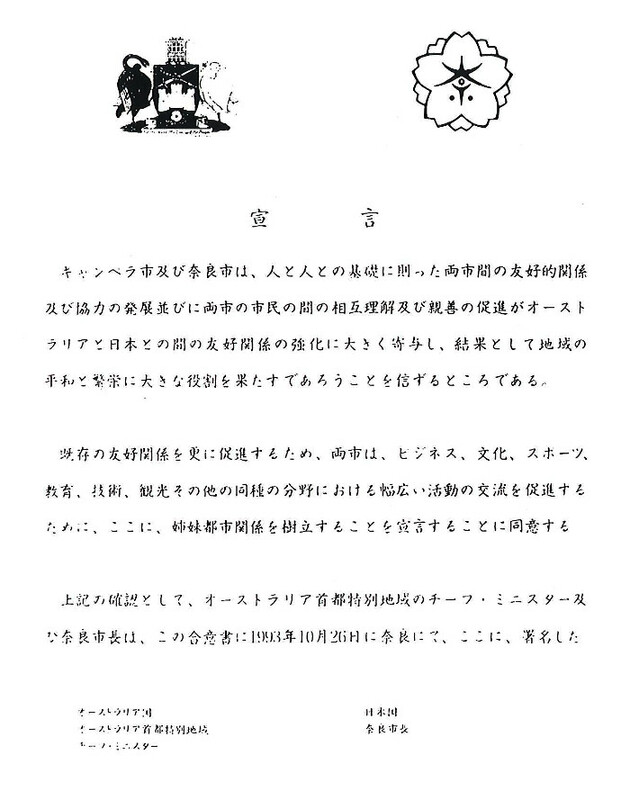 The proclamation declares that Canberra and Nara believe that "goodwill between the citizens of both cities will greatly contribute to the enhancement of friendly relations between Australia and Japan, consequently playing a significant role in the peace and prosperity of the region." 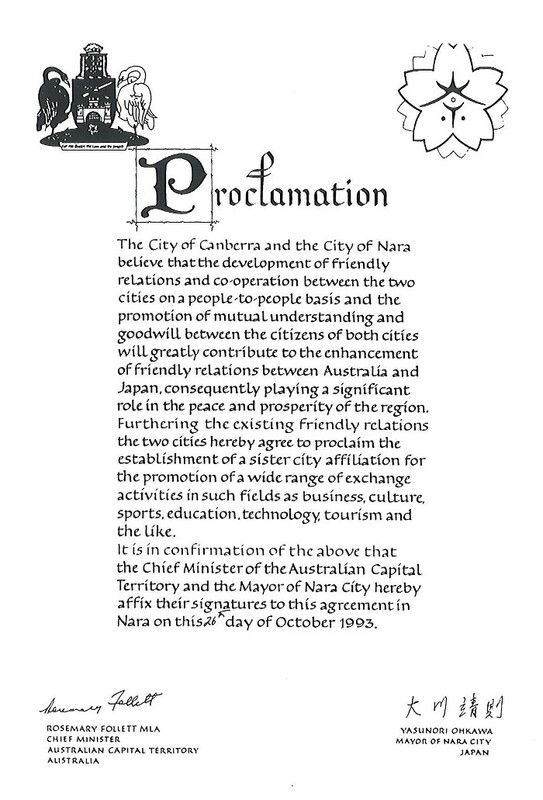 Proclamation for Canberra - Nara Sister City Relations - English version. A transcript can be found here: Proclamation Transcript. 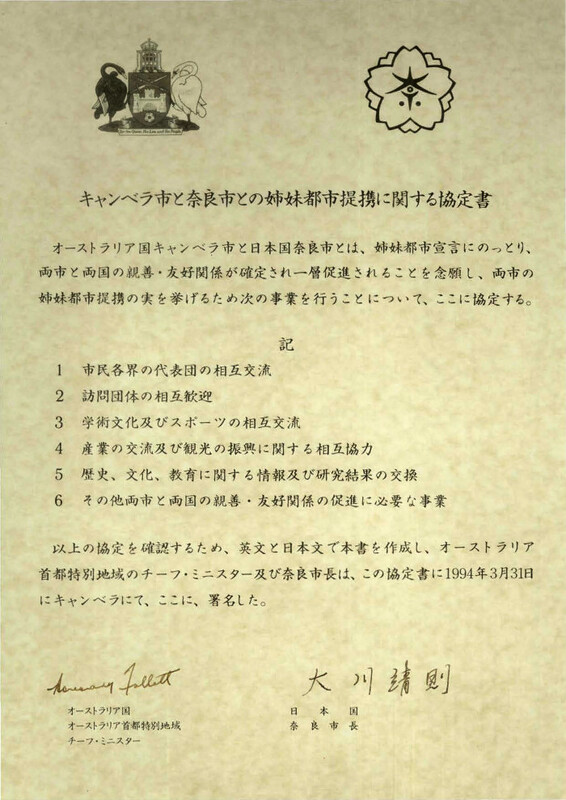 Proclamation for Canberra - Nara Sister City Relations - Japanese version. The concept of Sister City or Twinning relations began in 1947 as a means to promoting international commercial and cultural ties. "Sister city relationships are an overarching symbol of friendship that encourage and assist groups in government, business, culture and community to make contact with each other and build relationships of mutual benefit." The ACT Administration had received several earlier sister city requests over the years that were not accepted. Quezon City in the Philippines (1977) and New Delhi, India (1979) are two examples. In 1988 the Minister for Local Government, Clyde Holding, decided that "that the Federal Government would not progress the formal development of any twinning relationship, as that should be the prerogative of the ACT Government following self-government." Canberra had a community initiated Twinning with Versailles & Yvelines, France from 1987 to 1995. Organised by the Canberra-Versailles/Yvelines Twin Communities Association Inc., it was viewed by the ACT House of Assembly (the predecessor to today's Legislative Assembly) as a "people-to-people initiative and has nothing to do with Governments." Canberra currently also has a Sister City arrangement with Beijing, and there are also two less formal Friendship City relations with Hangzhou, China and Dili, Timor-Leste. In March of 1994 a delegation of over one hundred officials and citizens from Nara led by Mayor Ohkawa spent two days visiting Canberra. Part of this visit was to sign the Sister City Agreement between the cities. "The signing of the Sister City Agreement formalises community to community ties between Canberra and Nara which have built up over a number of years. These include twinning agreements between the Australia-Japan Societies and the Chambers of Commerce and Industry in both cities." Chief Minister's Media Statement 30/03/1994 - Sister City Agreement To Be Signed. A PDF version can be downloaded here: (PDF 364Kb). Agreement for Canberra - Nara Sister City Relations - English version. A transcript can be found here: Agreement Transcript. 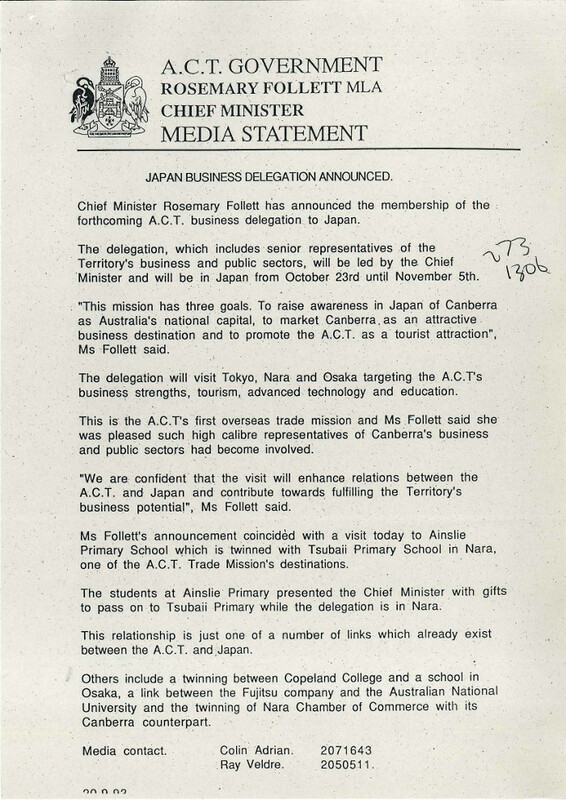 Agreement for Canberra - Nara Sister City Relations - Japanese version. Sister City relationships don't stop with an agreement. Newly available ACT Government files show that many parts of the ACT Administration were already thinking about how to make real use of the new relationship to extend economic, cultural and educational ties between Australia and Japan through the relationship with Nara. 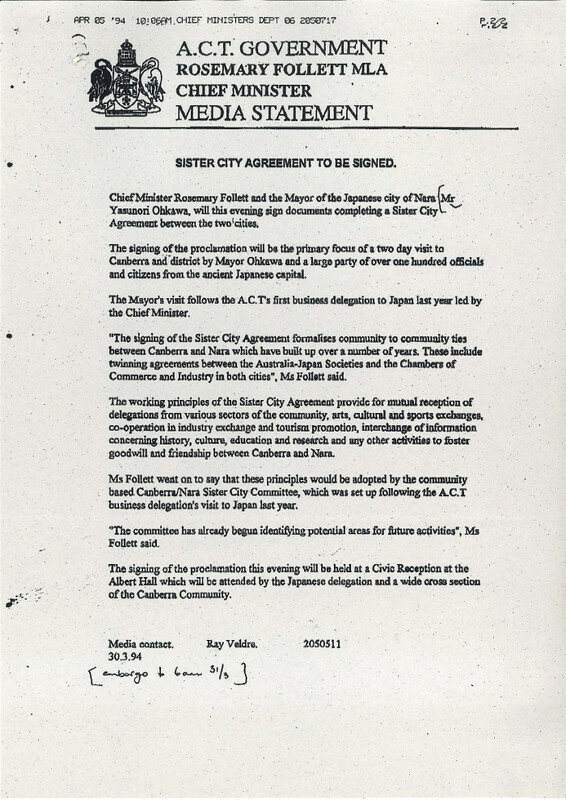 The files reveal a number of follow-up actions and opportunities that were identified soon after the agreement, including developing a photographic exhibition for display at the Nara City Museum of Photography, and arranging billets for a choir of 100 children accompanying the mayor of Nara to Canberra in 1994. One of the most notable was the proposal to develop a Japanese Cultural Centre set in traditional Japanese gardens, an idea which eventually became Canberra Nara Peace Park, opened in 1999. 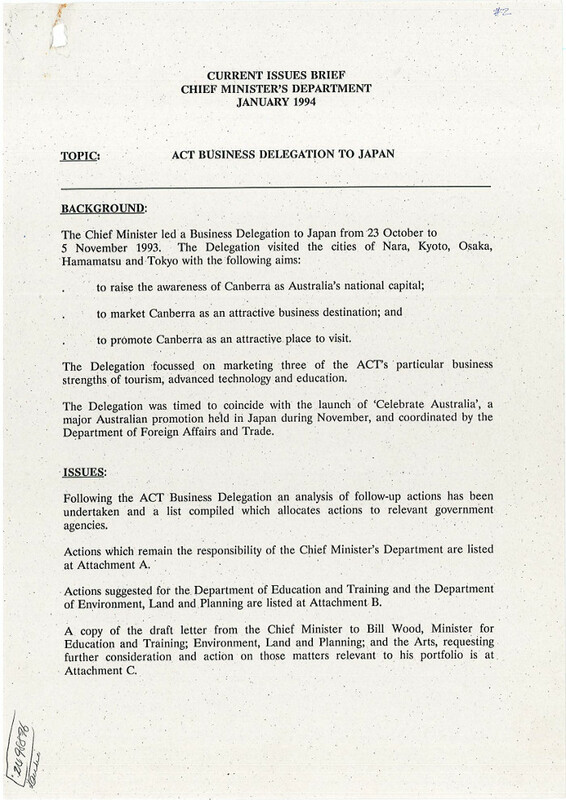 Current Issues Brief - Chief Minister's Department - January 1994 : ACT Business Delegation To Japan. A PDF of the full Brief can be downloaded here (PDF 1.85Mb).